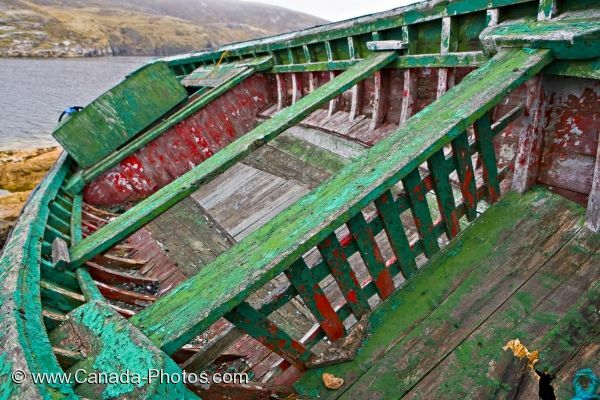 Years ago, this old fishing boat was pulled out of the harbour near Battle Island at the entrance to the St. Lewis Inlet in Southern Labrador and has remained there every since. Winter after winter, this boat loses more of its color and the wood starts to decrease in strength, but it is a historic piece from the days when this fishing village of Battle Harbour was thriving. Stern of an old fishing boat hauled out on the shore at Battle Harbour, Battle Island at the entrance to the St Lewis Inlet, Viking Trail, Trails to the Vikings, Southern Labrador, Labrador, Atlantic Canada, Canada. Picture of a historic fishing boat on the rocky shores at Battle Harbour in Southern Labrador, Canada.